A brand new game has been designed a launched for the Tate and the National Galleries of Scotland, by Bristol based creative agency Thought Den. Artists Room: The Game is designed to get people involved, and thinking about what goes into creating exhibitions in the museum space. 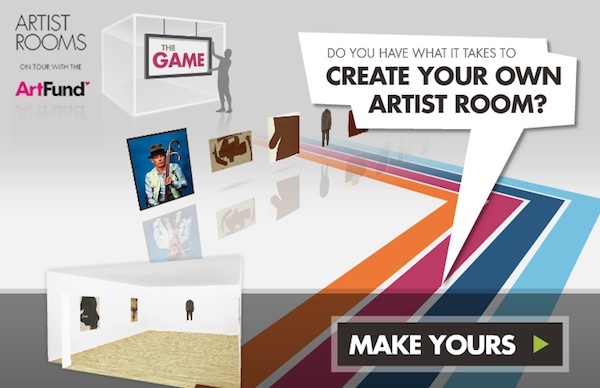 The game starts by prompting you to choose a team of people to help you create your artist room. You start with a limited budget for hiring so you have to think smart. Your teams strength and experience can help boost your game score, and the more team members you have, the higher your score multiplier. In choosing your team, you have to pick 4 types of team member, and for each type you can choose to have 1 member, 3 members or 5 members. You have to choose someone for each of the following; Interpretation, Preservation, Technical and Marketing. With such a small budget you have to balance the numbers on your team wisely. Once you've chosen your team, you then have to pick an artist that you'd like to exhibit in your room. We went for Ed Ruscha (big fans) and then were asked to pick 5 works from a given selection. Once you're room is set up, with your artworks hanging proudly, you're then ready to play the game. You have to go through the 4 areas of Interpretation, Preservation, Technical and Marketing, performing different tasks. For interpretation, you are taken to a work in the room, and asked questions about the work, and the artist in general. Answering correctly increases your score. For Preservation, you are taken to another work, and given a set of skill games, following the onscreen instructions to add more to your score. For Technical we are told how important lighting is to making the artwork look good, and keeping it safe. Then there is another skill game for getting the lighting right to score more points. For Marketing you are given scenes with various types of people pictured. You have to decide, based on what they're wearing or holding, what sort of marketing or media would get their attention. You have a choice of social media, print media or television and radio. You have to click on each person and assign the right media to admit them to your show. At the end, your score is added up, and people come to visit your exhibition. You can then post your scores online or try again to see if you can score higher with another artist. All in all an engaging game, full of useful information about the artist and the roles of museum staff, as well as helping you to think about what goes into building an exhibition.